"A wonderful family recipe that we have turned to often over the years. This simple dish is delicious and best served for its comforting warmth during the cooler months. Serve with fresh green beans." Pour crumbled saltine crackers into a large bowl. Press chicken pieces into crackers to coat completely; let rest for 10 minutes. Melt butter in a large skillet over medium-high heat. Saute chicken pieces in hot butter until browned on all sides, 5 to 7 minutes. Transfer chicken to a casserole dish. Saute mushrooms and onion in the same skillet until onion is translucent, 5 to 10 minutes. Pour chicken broth, white wine, salt, pepper, and tarragon into onion mixture and bring to a boil while scraping the browned bits of food off of the bottom of the skillet with a wooden spoon. 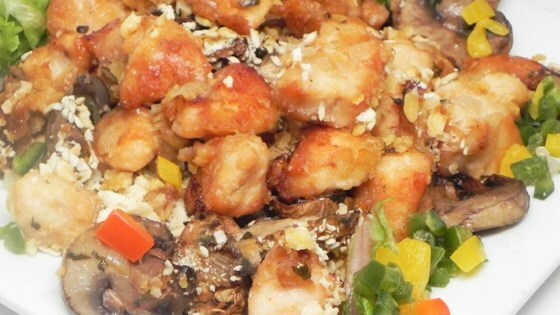 Pour mushroom mixture over chicken into the casserole dish. Bake in the preheated oven until chicken is cooked through and sauce is bubbling, about 45 minutes. The nutrition data for this recipe includes the full amount of the crumbled crackers. The actual amount of crackers consumed will vary.